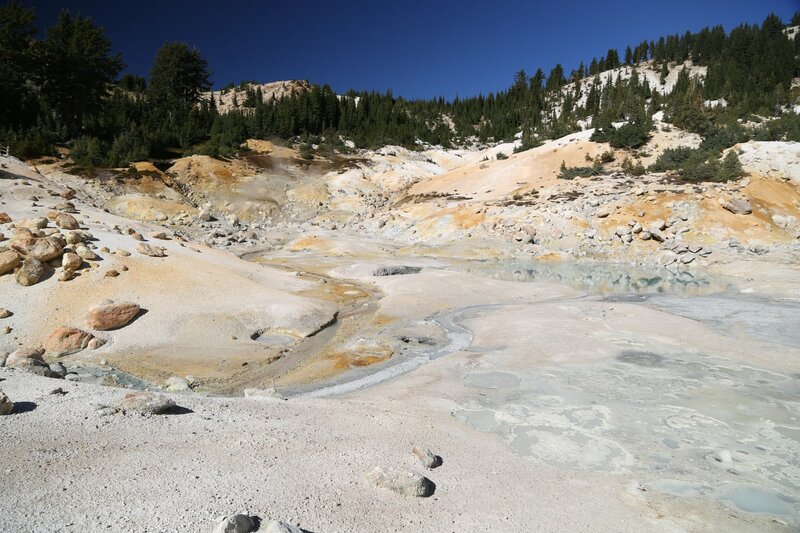 Bumpass Hell is a region of many hot mud pots, an area of geothermal activity. 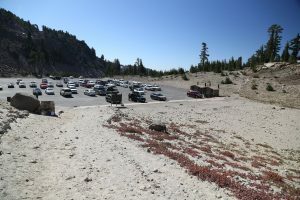 A trail leads from a parking lot in-between Sulfur Works and the Lassen Summit Trailhead. 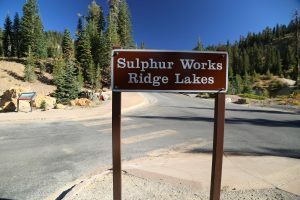 The trail to the sulfur works is about 2 miles one way. 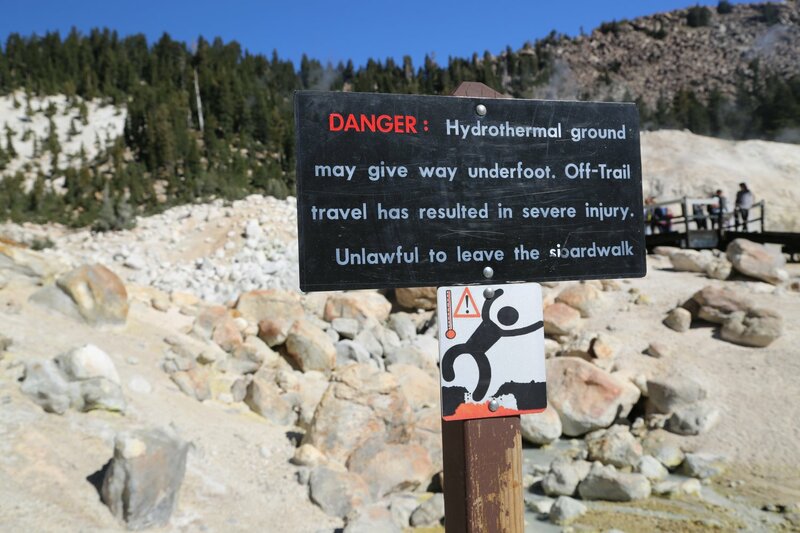 For the out and back hike – allow at least several hours. The trail is a good one. 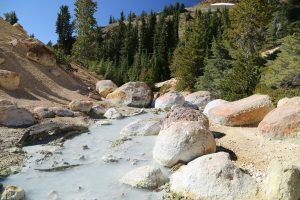 It begins fairly level and slowly climbs to a crest and then becomes somewhat steeper and drops down into a little valley where you will see the mud pots. 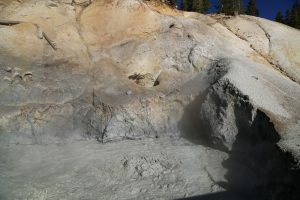 Some of these boiling mud pools are extremely hot. Mr. Bumpass, the namesake for this area lost his leg when he accidentally stepped through what seemed like solid ground into an underground boiling cauldron of sulfur, water, pyrite and mud. Once the trail reaches the fringes of this area it becomes a wooden boardwalk. 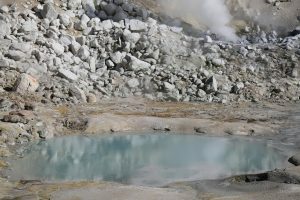 Stay on the boardwalk for it could be dangerous to venture out on your own near these boiling pools. In the wintertime this is a good area to stay warm. This is one of the few parts of the where you can see the ground year round. 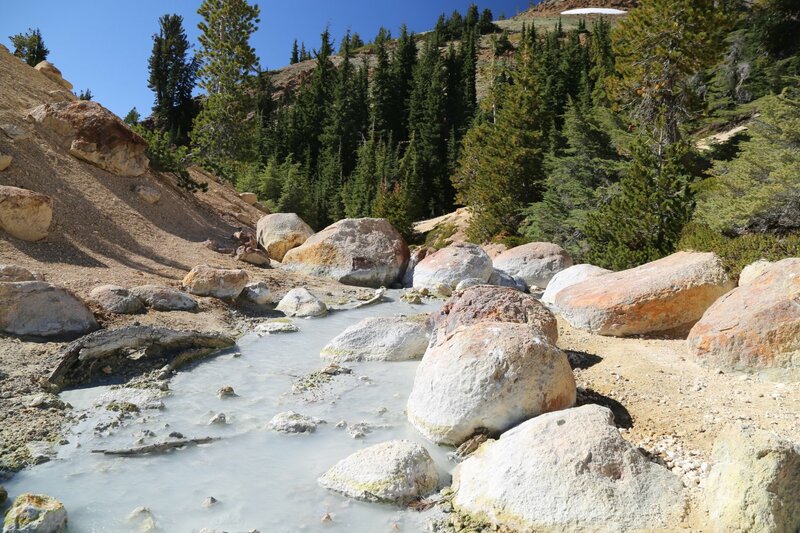 The snow melts as soon as it touches these hot pools. 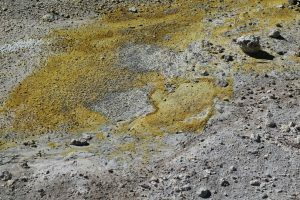 Like the Sulfur Works next to Highway 89, this area also reeks of sulfur. 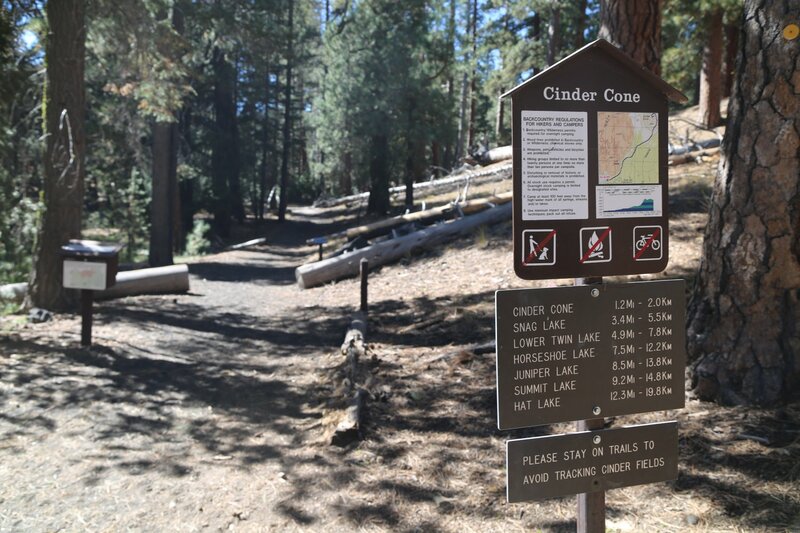 Cinder Cone is a located on a section of trail that extends many miles into the back country of Lassen Park. 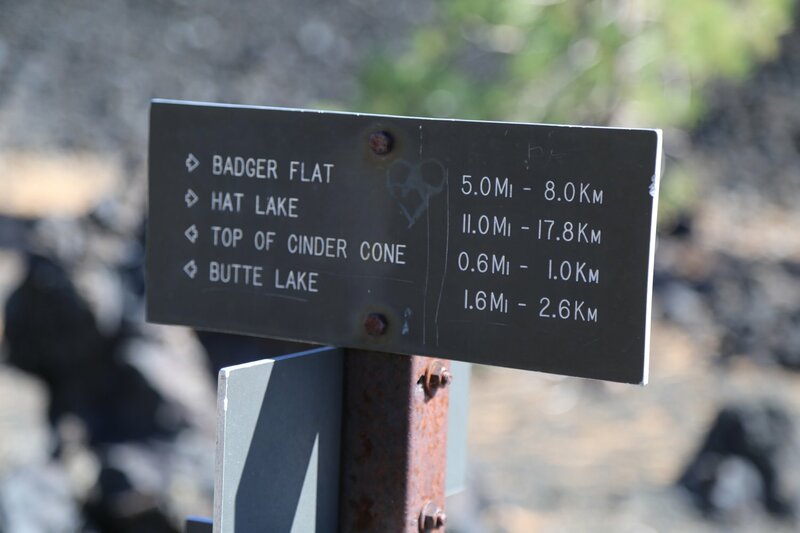 The actual hike to the cinder cone out and back is approximately 2 miles. Allow several hours at least for a leisurely walk. A graded good dirt road that leads to Cindercone trail head exits Highway 44 on the northern part of Lassen Park. 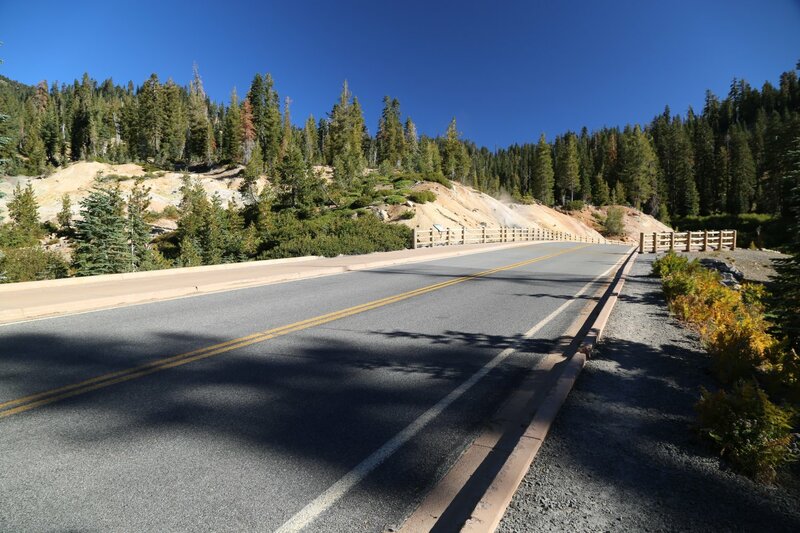 This road leads to Butte Lake – which can be used as a landmark. 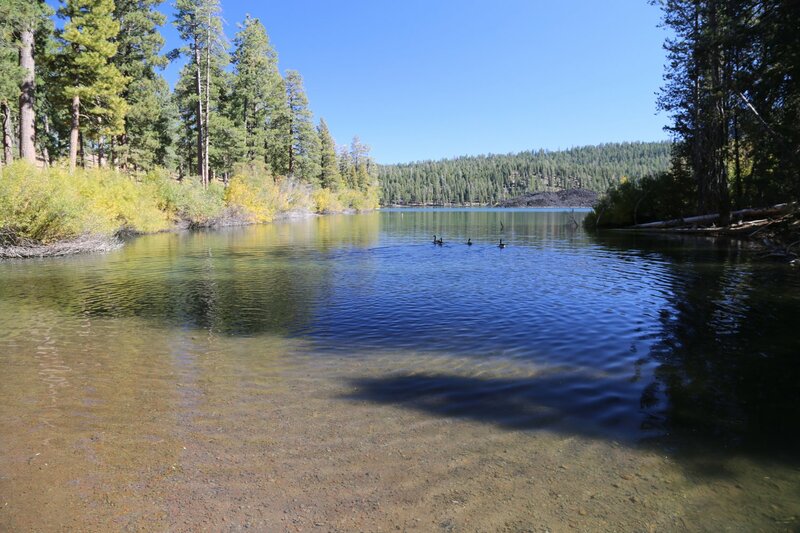 There is some good trout fishing in this lake and other lakes along the trail once you pass the cinder cone. 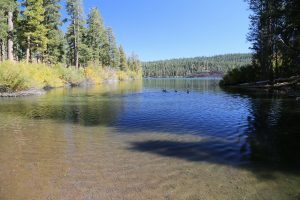 This lake also makes for a refreshing dip or swim after returning from the very dusty Cindercone trail hike. 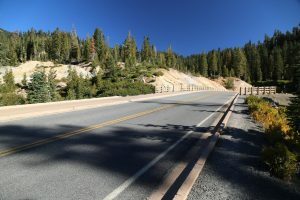 Towards the end of this Butte Lake road you will see several small camp sites. 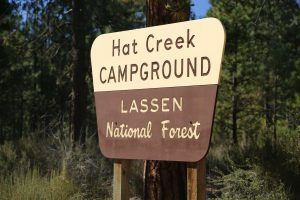 The campground that I recommend camping in is Butte Creek Campground located next to a small stream about 2 or 3 miles from Butte Lake. This campground is free and the sites are off the road a ways, so you aren’t getting too much dust from the cars, and the babbling of the small stream nearby is quite pleasant and calming. The best camp spot is across the little creek – the last one in the campground. There is a campground at Butte Lake which after several years of being closed is now open again. 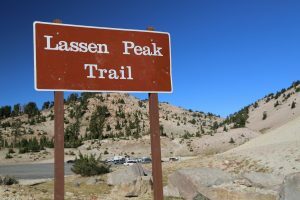 If you enter Lassen National Park from the Butte Lake trailhead and you camp here, you pay the park fee plus the camping fee. The trail to the cinder cone leads off from the parking lot at Butte Lake. 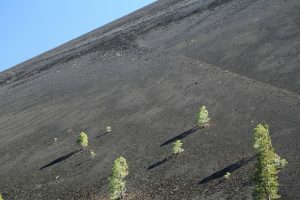 There are often Cinder Cone Natural Trail printed guides avaialble fora small fee here. 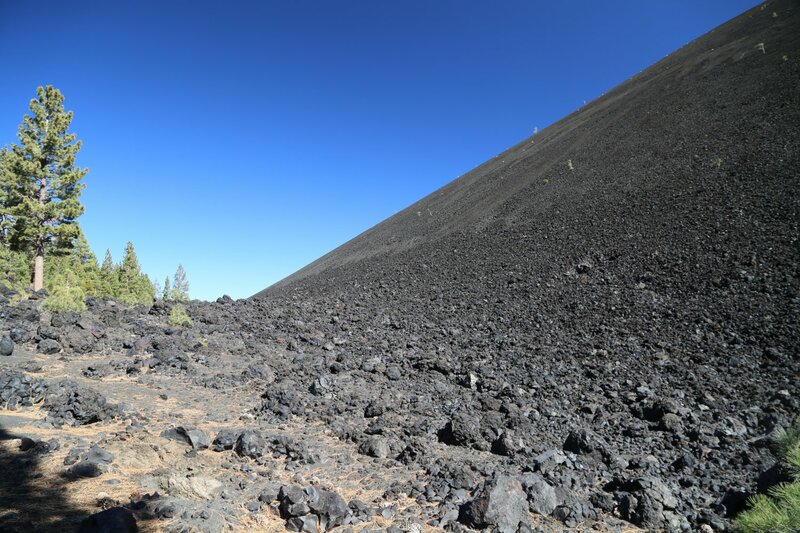 These list 14 points of interest along the Cinder Cone hike – mostly geological related. 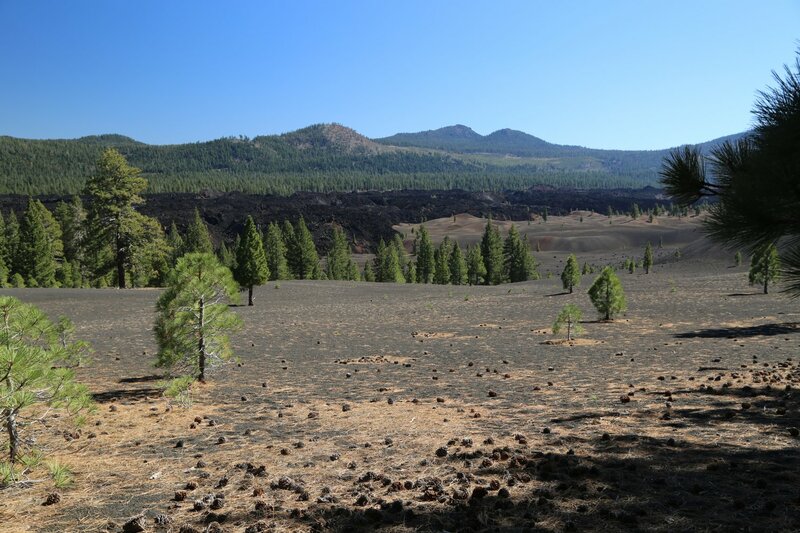 As you walk the trail that leads to the cinder cone you will pass tremendously large lava flows. 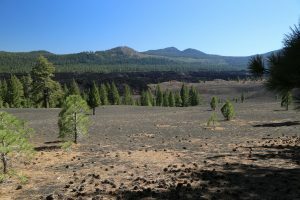 In fact most of the trail is at the edge of these lava flows. 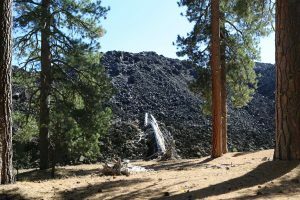 Only after you reach the top of cinder cone will you see how extensive these flows actually are. 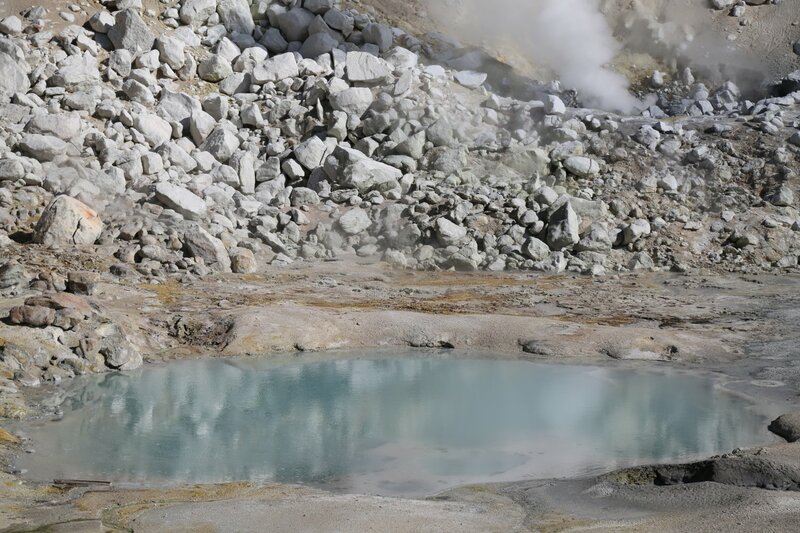 At close up range these flows will be composed of large sharp looking black volcanic rocks. When you view these flows from afar they will look like many small black hills winding their way over the landscape. 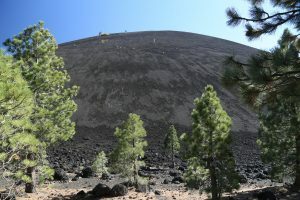 Through radio carbon dating (a tree was finally found that was destroyed by the lava flows), it is estimated the Cinder Cone was created in 1650. Once you get close to the cinder cone you will be struck with how stark it looks. It is composed of pure cinders and rises out of nowhere like an alien organism that has been temporarily transported to a foreign landscape. You will be lucky if you can spot the several trees or bushes growing on its sides. 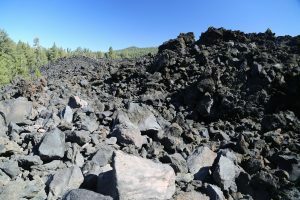 Geologists have estimated that its age as well as the age of the nearby lava flows to be around 3 to 400 years old. 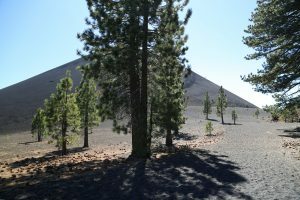 Depending on the time of the year, as you walk this cinder cone trail you may run into geology classes coming to this area to conduct studies. Fall is a good time for this. If you do meet a class try to hang out and listen to the professor; it is a good way to learn about the fascinating geology of this wonderful park. I have met classes from several Junior Colleges throughout the state as well as classes from Chico State University. 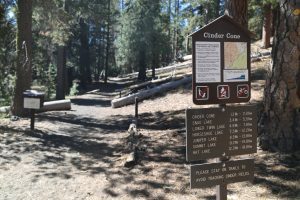 If you think the trail leading to the cinder cone is bad because of the difficulty walking on the cinders, wait until you have to ascend and descend the cinder cone. 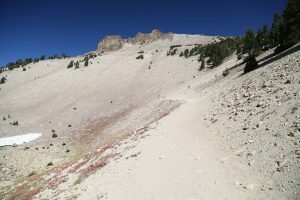 The side trail takes off from the main trail and climbs up the cone. 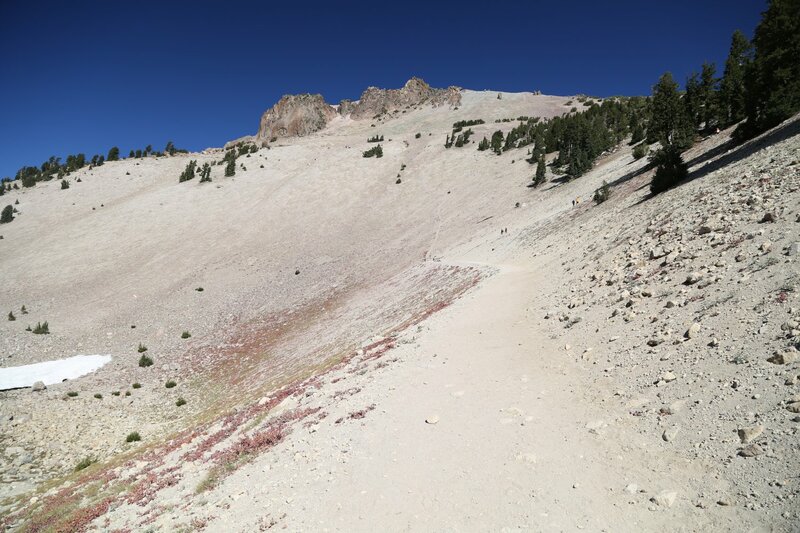 The trail winds straight up the side and only makes one switchback by the time it reaches the crest of the cone at 6,907 feet. If you were hiking on solid ground the steepness wouldn’t matter as much. However, you are hiking on small cinders and for one step forward you take about three backwards due to the 30 to 35 degree slopes. This hike is a lesson in patience! Once you reach the top you will be richly rewarded with natures splendor. I highly recommend doing this hike just before sunset or very early in the morning. From the top you have a 360 degree view. 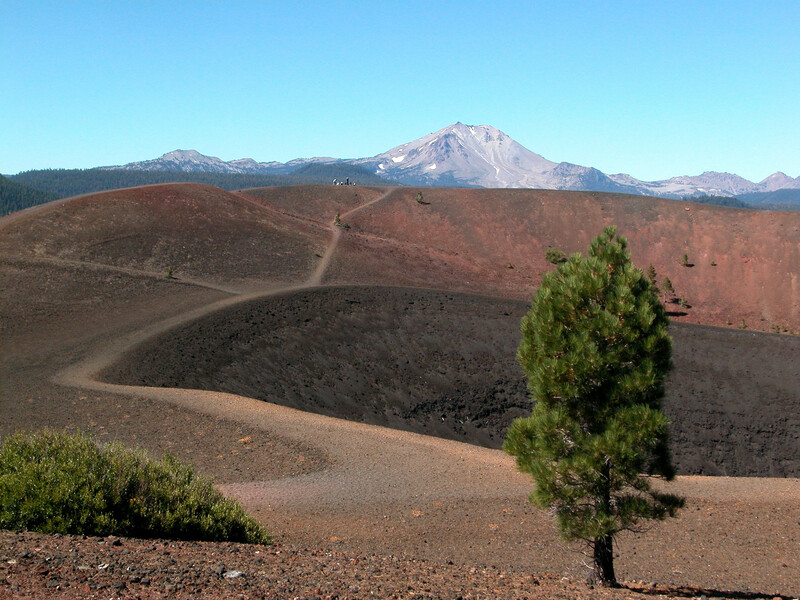 You can see Mount Lassen in the distance, the lava flows, several lakes created by the lava flows, the painted desert. The painted desert is a brilliantly hued landscape created from the different colors in the cinders created by the volcanic activity. Also notice the many depressions that are present in the cinders at and around the base of the cinder cone. These were formed from volcanic bombs, or hot rock magma that was spewed from the cinder cone during its eruption. There are several concentric rings that make up the inside of the cone. 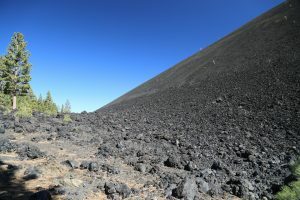 You will be able to hike at a leisurely pace around the cinder cone in about 20 minutes. Then once you have viewed the scenery from above take one of the trails that lead down into the cone to the next circular level. Think of a funnel with several different levels present inside. 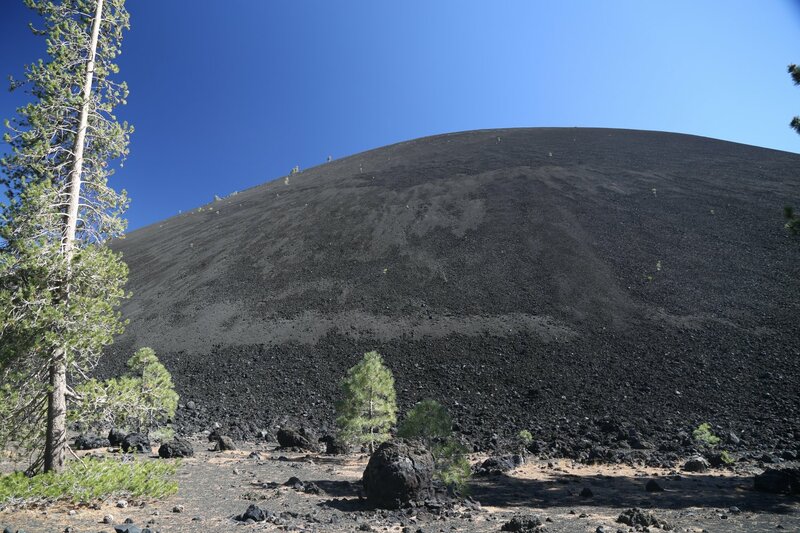 This is the shape of the cinder cone. From the second level you can take a trail that descends deep into the heart of the cone. From the top level of the cone you can’t see the bottom. From the second level this trail that leads to the bottom looks like an hour round trip hike. Trust me, this is an optical allusion. You can be on the bottom in about 5 minutes, and back up in about 10. If you have never spent a night in the heart of a volcanic cinder cone this would be your chance. The bottom of the cone stretches maybe 15 feet in diameter, and the rocks are larger here then any of the other cinders/rocks elsewhere on the cone. Just don’t stay too long or you may become warmed by the magma. Just joking, the cone is currently dormant. Descending the trail is fun. You sort of slide and jump and let the cinders carry you down. Instead of taking one step forward and sliding back three, you take one step and slide ahead for about 4 or 5 steps. Course by the time you reach the bottom if there hasn’t been any recent rain, you will be covered in cinder dust. 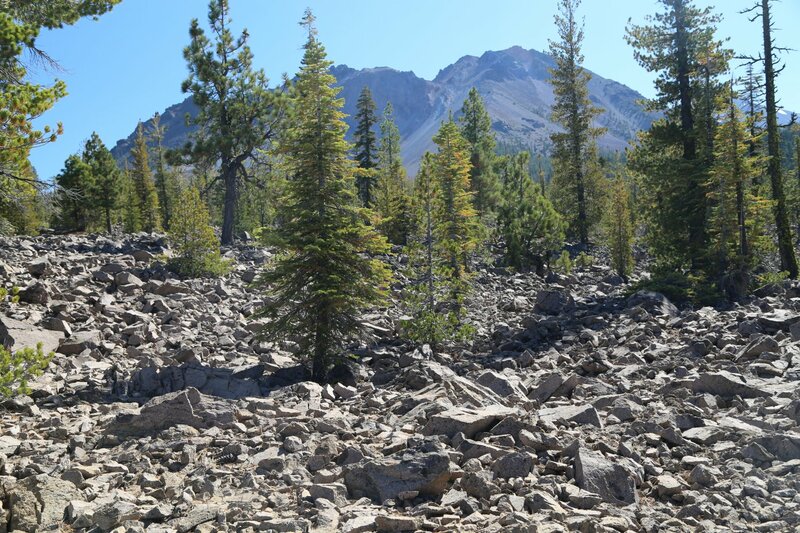 Chaos Crags and Devastated Areas are two separate areas separated by about 15 or 20 miles but they are both similar in appearance and were created as a result of the 1915 Lassen explosion. 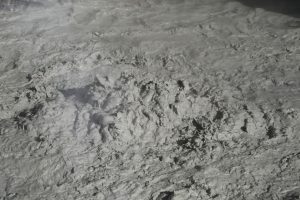 Chaos Crags/Jumbles was created by an air cushion avalanche. 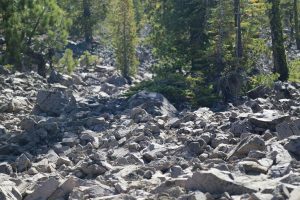 This was created when rocks and magma mixed with snow, ice and vegetation came hurtling down the slopes at an incredible velocity, removing and killing everything in its way. 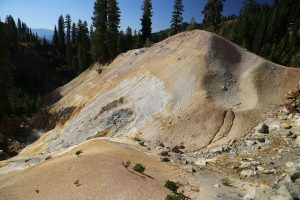 The Devastated Area was caused by magma that erupted and flowed down the slopes. Both areas have recovered significantly since the initial eruption and vegetation has overtaken what was just piles of rocks. 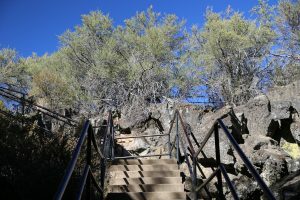 In just the past 30 years the Devastated Area has had an explosion of new growth and new trees to the point that visitor’s might now wonder why these areas earned their names. The numbers of different plants species in the park is interesting. 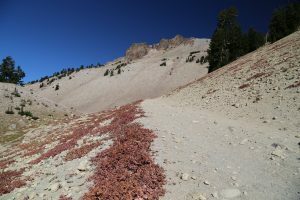 Mount Lassen sits at the end of the southern range for many Cascade plant species and at the northern range of many Sierra species. 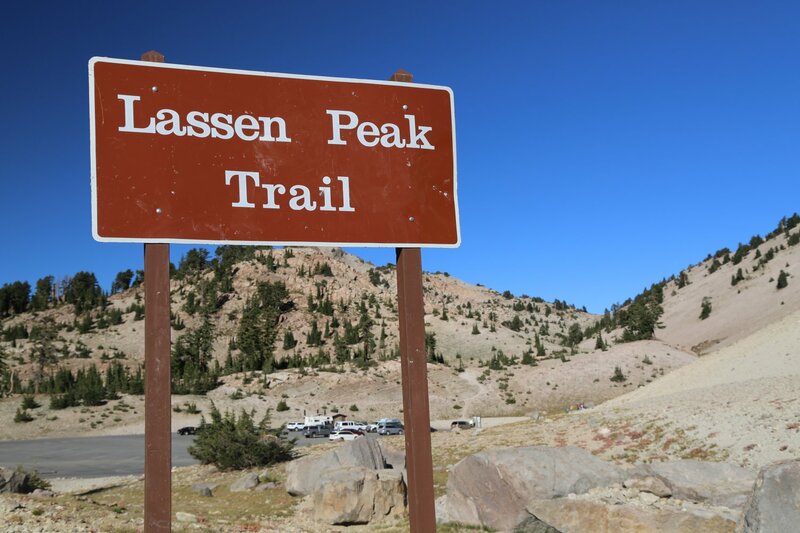 The result is that Lassen Park contains approximately 800 plant species while its sister to the north Shasta contains only approximately 500 species. Hat Creek is slightly outside of the Lassen National Park Boundaries. For several miles outside of the small community of Old Station, there are a number of places one can access this fast flowing stream. Hat Creek is very popular with fisherman and you often see them walking the banks here with fishing poles in hand (there are several campgrounds here next to or near the creek. 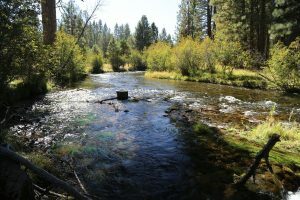 As you head east on Highway 44, away from Old Station – soon the public access to the creek disappears as the creek is surrounded by private property. 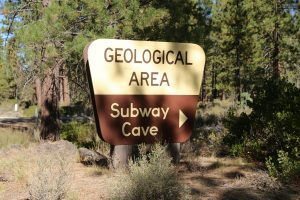 Lava Tube Caves or as they are better known, Subway Caves, are well worth a visit. They are located just outside the northern part of the park near the junction of Highways 44 and 89. They are actually located on Highway 89 about 0.5 miles north of Highway 44. 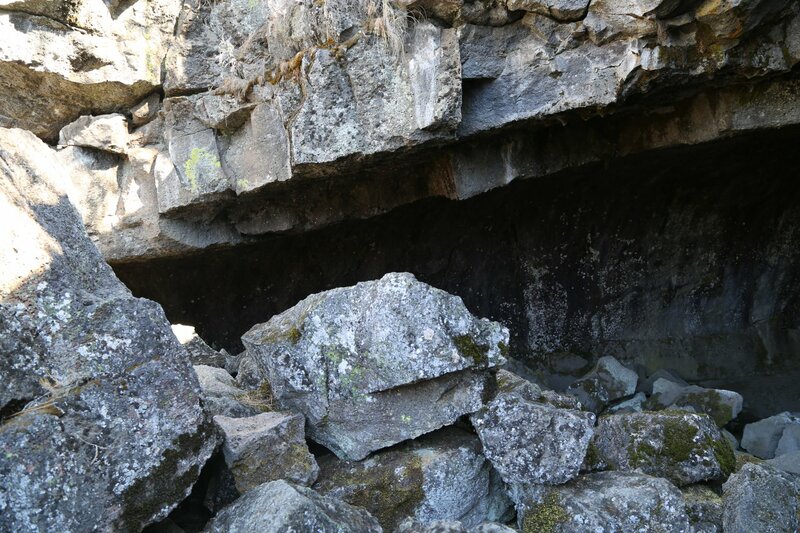 These caves formed when lava and magma cooled above the surface of the soil. These caves wind for up to 25 miles past where the main exit is located. However, approximately 1/3 a mile of these caves are open to the public. The temperature of the caves remains constant. It is a bit chilly inside the caves, especially if you are entering on a cold day. Warm clothing is recommended and a flashlight is a must. You can’t see anything inside the caves without some sort of light. You can wave your hand 1 inch in front of your face and you won’t see a thing. 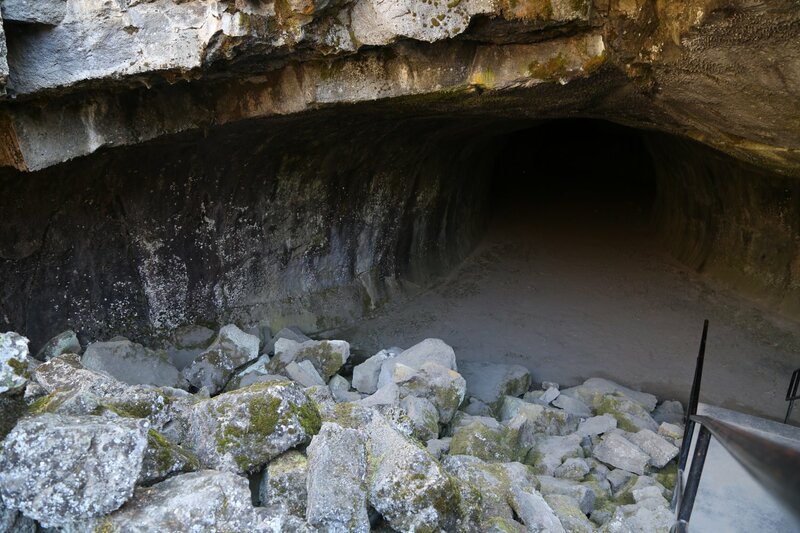 The trail leads along what is basically a large tube with side caves extending off from the main cave. At the entrance of these caves you may notice another entrance that is partially fenced off. This entrance is closed to the public, and it is through this entrance that you can access a much larger network of these tube caves. 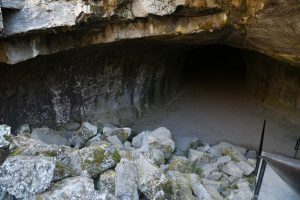 I have explored several of the narrow caverns past the fenced off entrance – the longer of two ends at a bunch of graffiti and drops to less than a foot between the ceiling and the floor. I once had a geology professor who took his entire class through this entrance. I remember him telling us that they walked for about an hour exploring these caves. He said there were many areas where the ceiling of the cave had caved in and there were large rock piles on the cave floor. However, this type of activity is not recommended. 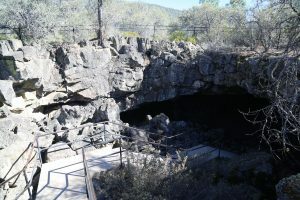 The caves that are not on the trail route can be dangerous, and the fence in front of this entrance has been put there for a reason. Lookout Point is located on top of the grade that climbs out of the small town of Old Station near where highways 44 and 89 meet. 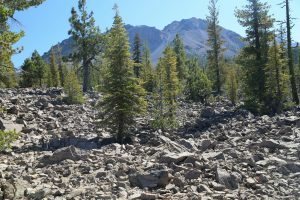 This is worth taking a few minutes – you look out over the Hat Creek Valley – you can recognize the Hat Creek drainage by the lines of trees that snake their way through this valley. The trees are growing near the river and most of the rest of the valley is covered in low lying shrubs. The highlight of this look out is you have great views of both Mt. 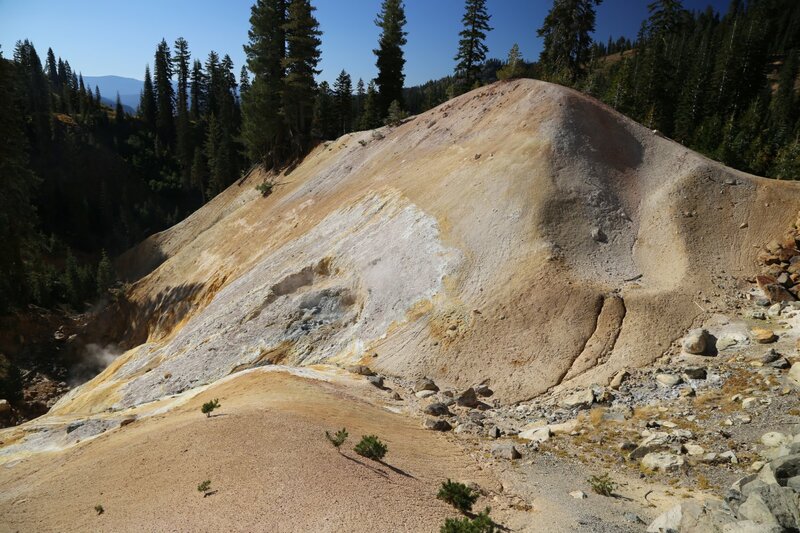 Lassen and Mt. Shasta. This would be the idea place for an expansive living room window. Free use of telescopes available. Mount Lassen is the heart of Lassen National Park. You can see this giant peak from most parts of the park. At 10,457 feet the summit is readily accessible for most people in under a couple of hours. Guide books recommend between 4 and 5 hours to summit and return. These are good recommendations if you are in average shape and want to take a leisurely hike. However, if you are fit and want to push yourself, and don’t want too much time at the summit, you can make the round trip in under 2 hours. I’ve been to the peak a number of times – my fastest one way summit was 55 minutes, but I did run most of the way. The peak trail underwent a four year restoration project in which a significant amount of rocks were relocated, rock walls built and general improvement to the trail was conducted. This was completed in 2014. There is a rather large parking lot at the trailhead (bathrooms are also available here) The trailhead and parking lot are located near the summit of the road on your left side as you drive north. Be prepared for inclement weather no matter what the time of the season. The best time to hike this trail without having too much snow in your way is late July to early September. I hiked this trail with a friend in mid August in the middle of a driving snow storm on Friday the 13th. The weather can be quite variable no matter what the season. 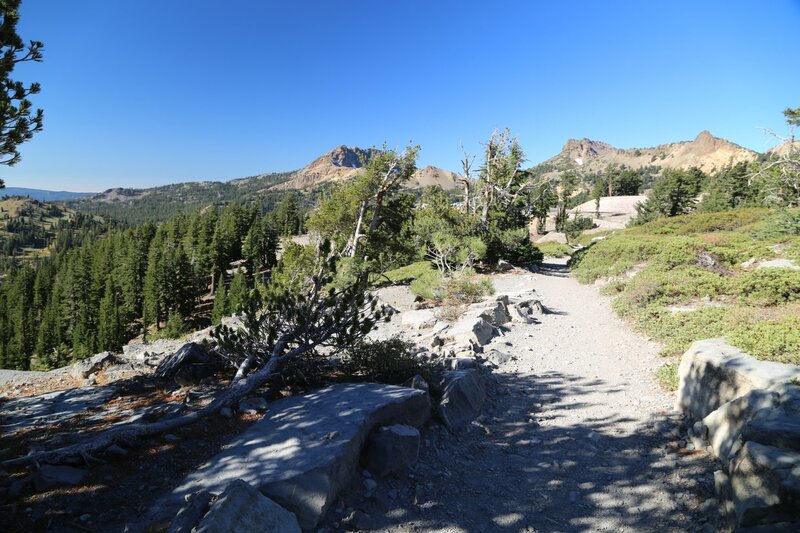 The trail is a good one, it is not too steep but it makes quite a few switchbacks. Note the prominent steep shortcut on the first leg of the trail leading straight up the mountain. While tempting to climb this shortcut, this is a mistake. I’ve seen rangers stop youngsters from climbing this trail. Always stay on the main marked trail. 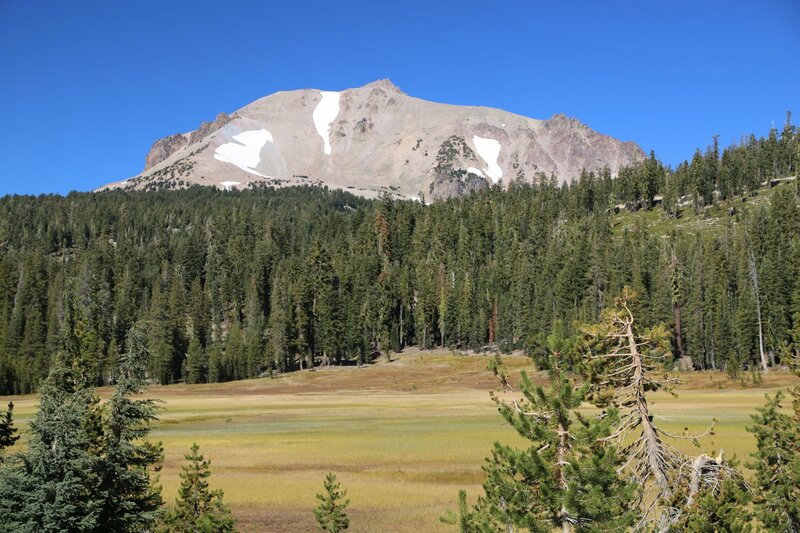 When you get close to the top, if it is a somewhat clear day you will be able to see Lassen’s giant sister to the north Mount Shasta. Don’t be fooled once the trail reaches what seems to be the top and levels out. This is only the pseudo summit, and as their are no signs pointing the way to the true summit, many people turn around here. After the trail levels out on what is the top of a ridge continue hiking to your right. The summit is still several hundred yards away. The last couple of hundred feet to the summit are quite steep and there is not a single trail that leads to the top. 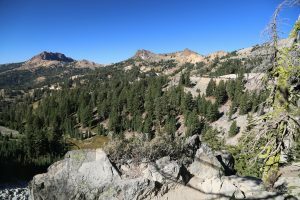 There are several smaller trails that wind their way around large rocks and all end at the summit. Your choice of one trail is about as good as any. The summit is small and there is not much room. It is composed of several large pointed rocks. The tallest is the summit. You will also see a radio antenna that someone built on the south side of the peak. 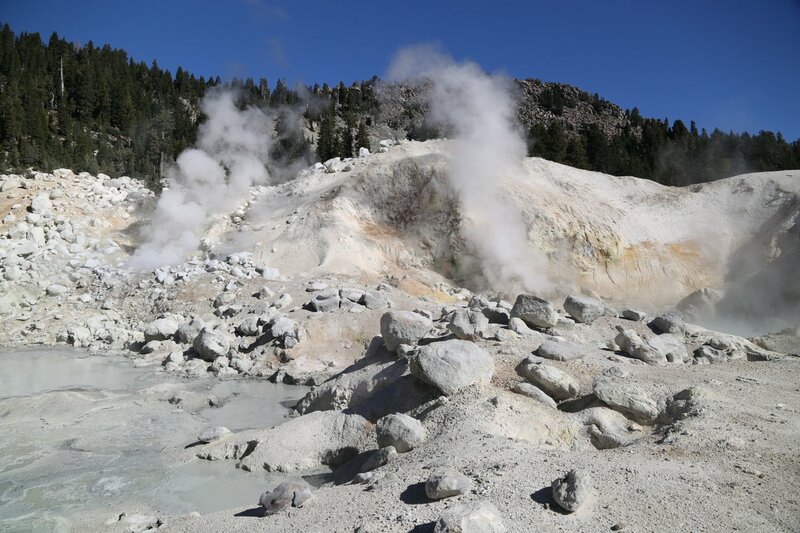 Sulpher Works is a fascinating display of steam vents, sulfur steams, and mud pots. Unlike Bumpass Hell this is right next to the main road and there is a boardwalk that leads through this region. Sulfur works and Bumpass Hell can somewhat be compared to Yellowstone National Park, but on a much much smaller scale. 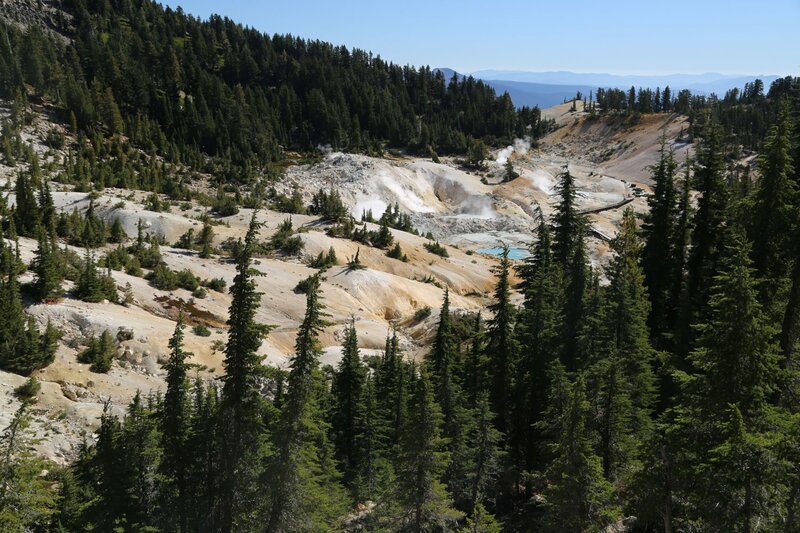 Bumpass Hell is more impressive than Sulpher works. 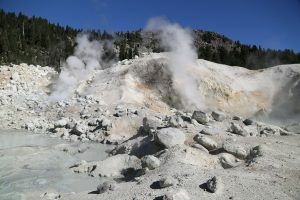 The one sulfur steam that you can often see rising for several miles away (seasonally fluctuates) is located right next to the south side of the road. A fence has been built around it to keep people from falling in. On a cold crisp day you can remain warm if you stand in the steam that emits from this steam bath. However note that there is an always present sulfur smell that permeates everything. 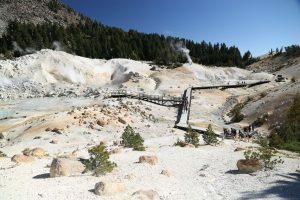 The boardwalk trail on the other side of the road from the largest sulfur steam is an easy hike out and back and shows you a variety of mud pots and other geothermal activity. This hike is about 1/4 mile or less one way. If you continue driving on the road past this point, you will pass several beautiful lakes next to the side of the road. The road really begins to climb at this point, is quite narrow, and has many switchbacks. 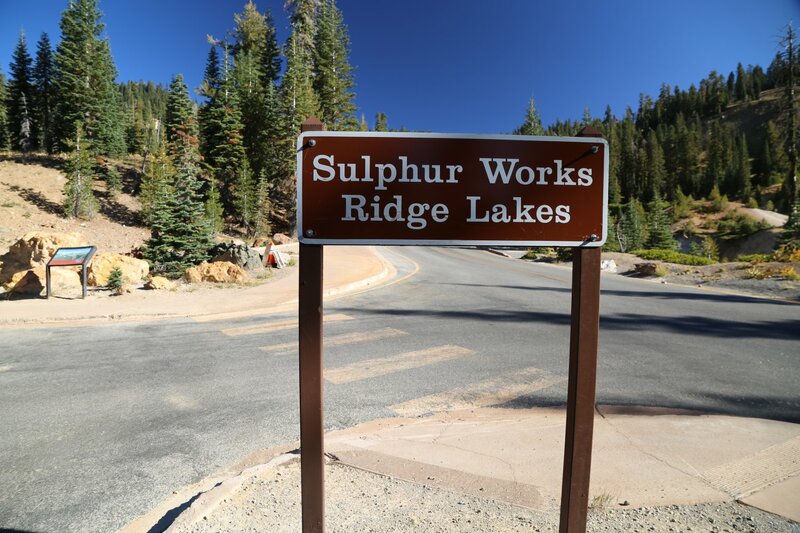 The distance from the Sulpher Works to the Mount Lassen trailhead is about 4.5 miles.